Creating a successful brand is more than just designing eye-catching pieces of clothing. That’s just step one in the process. For your line to take off and be noticed you need to plan everything, down to the tiniest detail. And one of those details is the labels you use for your merchandise. Which is why I am a firm believer in using leather patches. Synonymous with excellence and class, leather instantly elevates any line and gives it an air of elegance. Don’t believe me? You will. Read on to find out what a leather patch can do for your brand. •Versatility: You can use leather for hang tags or directly on your merchandise, giving you options in terms of how you use the patch. Have your logo hang from a sleeve, put product info inside a jacket, or display a message. •Durability: Leather is built to last, which means your logo or product info will too. It can survive the elements and repeated washing without fading, tearing, or ripping, ensuring your products look their best on day 1 or day 100. •Customization: With leather, you have the ability to fully customize your brand’s look. You can create leather patches in lots of shapes, sizes, and colors, adding a distinct look that won’t be found elsewhere. From buttery soft leather in yellow to plush suedes in green or any other color, the choices are endless. And so are the designs you can use. For instance, if you sell Christmas sweaters, you can have snowflake cutouts or Santa hats. These are things you simply can’t do with paper or other flimsy tags. There are a lot of reasons to use a leather patch over other fabrics, like polyester, canvas, or silk, some of which you may not realize. 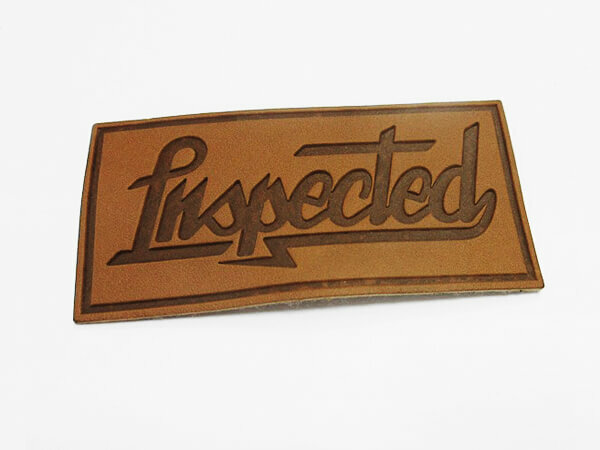 Let’s look at what a leather patch can do for your brand. Think about it; when you examine clothing in a store, what’s the first thing you look at? Right, the label. So, doesn’t it make sense to pick a patch that is unique? You want shoppers to be impressed and a leather patch will do just that. It draws the consumer’s eye, commanding their attention and subliminally saying your merchandise is worth it. In the competitive world of design, it’s important to stand apart from the crowd and leather lets you do that with ease. This is especially true for jeans or jackets, which often look very similar from brand to brand. Here’s something you may not realize: using leather patches makes shoppers feel like they’re getting a bargain. Leather is seen by most as a high-end material and is equated with money. Which will make shoppers equate your line with money. So, if your brand isn’t expensive, they’ll feel they are getting designer quality at bargain prices. This is a smart, subtle way of boosting your brands image and can easily equate to increased sales and brand loyalty. Does your brand have a slogan or message? Do you have a story you think your buyers should hear? If so, using leather ensures that you get that message across loud and clear. Paper hang tags can tear, become wet, or fade with time. With leather, you eliminate those issues, so your symbol or message will hang proudly. For example, if part of your proceeds goes to a cause you can write a little story about it on the patch. This gives shoppers a better idea of what your brand stands for and helps you connect with them on a more personal level. Leather patches give you the opportunity to say something that matters and add an intimacy to your brand; shoppers will feel like they know you, or identify with you, which may lead to brand loyalty and exposure. Hang tags tend to bend or become worn after constantly being touched while inside tags made of cotton, silk, and other materials tend to fray after repeated washings; leather doesn’t. Frayed, bent or worn patches give clothes an old and dingy look, which is something you don’t want. By using leather, your patches will stand up to repeated handlings, so pertinent information, like the size, materials used, or pricing, is always easily visible. In addition, it maintains the integrity of your brand, as it gives your clothing a finished, polished, look over time. The one thing shoppers look for, above all else, is quality. They want to know their money is spent on products that are well-made and meant to last. A throw away tag, or one that crumples, gives the impression you don’t care- so, why should they? Leather says you took the time to take care of every detail; someone who spends on every aspect of their brand, not just the “flash and bling” is a person who most likely creates a line that is refined and is held to a higher level of excellence. Fact is, you can’t cut corners and create a recognizable brand. Which is why leather is the way to go for your labels. A leather patch pulls your brand together, like the cherry on top of a sundae. It is the final piece of your line’s puzzle, dazzling buyers and letting them know you create the best and only want the best for your customers. Let Sun Tat help you create leather patches that will put a “seal” of approval on your brand.